Radishes are a swollen and pungent-tasting edible root from the Brassicaceae family. Domesticated in Europe in pre-Roman times, radishes have been grown and consumed throughout the world and eaten primarily raw as a crunchy veggie topping in salads. Radishes provide a peppery and satisfying crunch similar to cabbage. 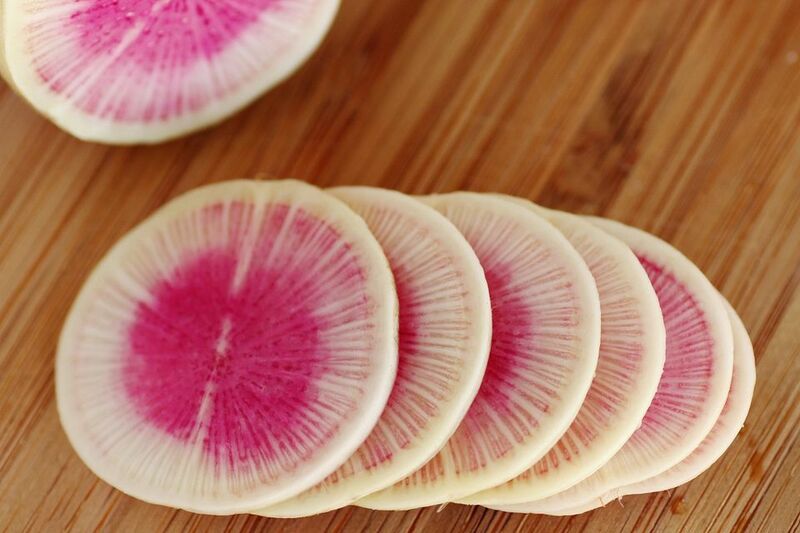 Red, white, and purple radishes are a great source of vitamin C, folate, fiber, riboflavin, and potassium. Radishes are also great as pickles and can be fermented into fiery kimchi—a spicy pickled cabbage is known as the national dish of Korea. Whether you pickle your radishes so that they're loaded with probiotics, or give them a gentler taste with an overnight refrigerated pickle recipe, you'll enjoy the preserved transformation. Pickled radishes are delicious on tacos, burgers, and salads. Fermented radishes can also be used in cold summer soups or as veggie crackers (with some added flavor like cheese or butter). In fact, pickled radishes are often used as a condiment in popular dishes like Pad Thai. Use colorful varieties of radishes, like watermelon or cherry belle, as a treat for both your eyes and your palate. Fermented radish pickles are delicious and full of probiotic health benefits. However, pickled watermelon radishes develop dramatically during fermentation, releasing a strong and pungent smell. The bright flavor and burst of color can be quickly pickled into a jar with vinegar, water, salt, and sugar. Once fermented, the pickled slices taste delicious in banh mi sandwiches and whole grain bowls. Add some acidity to your meals with pickled radishes that last in the fridge forever. 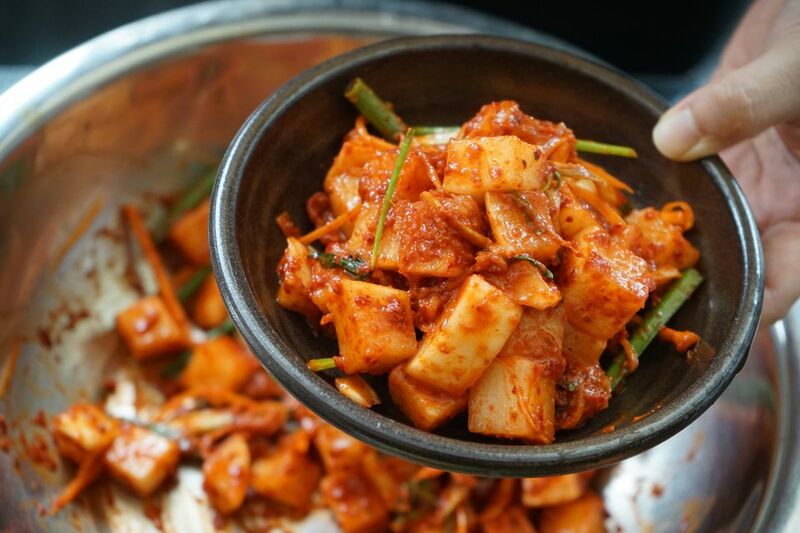 Kimchi is a staple in Korean cuisine typically made of salted and fermented vegetables like napa cabbage, radishes, and seasonings like chili powder, scallions, garlic, ginger, and jeotgal (salted seafood). Traditional kimchi includes Daikon as its type of radish. Using red-skinned cherry radishes or French breakfast radishes can provide your recipe with a cheerful color, though other flavors and colors, like the pink watermelon radishes, can also be added. No matter which vegetables kimchi is made with, it's loaded with probiotics—live microorganisms that provide health benefits for your digestive system. Serve kimchi with other Korean or other Asian-style dishes, or mix it into rice and other cooked grains. Then, grab two clean glass pint jars with lids for the fermentation. You can also consider using this recipe for baby cucumbers, carrots, cauliflower, or other veggies. Make sure you don't add too much sweetness, however, as the brine should be more salty than syrupy. Adding dill, like mint or basil, can also add a nice kick. Pickled carrots have all the crunch and heat of the fresh vegetable, plus some extra zing from the vinegar brine, herbs, and spices. If you like spicy food, add a generous amount of red pepper flakes and garlic. Spicy carrot pickles are full of flavor and make delicious snacks. Serve spicy pickled carrots on their own as hors-d'oeuvres or add them to salads. You can also enjoy them with hummus or mild dips and spreads. For that extra crunch, pack spicy pickled carrots into sandwiches. Radishes are often fermented in kimchi as one of the vegetables that serve peripheral roles to the main ingredient, cabbage. However, fermented radishes are tasty enough to deserve their own recipe. Plus, lacto-fermented foods like these radish pickles are rich in probiotics. Laco-fermentation is a process that lends itself to traditional dill pickles, kimchi, and sauerkraut. It simply uses salt, vegetables, and water without any canning or fancy equipment. This quick pickled radish recipe is ready in about 20 minutes, and the sweet and salty flavor makes it a perfect side dish. In fact, it's almost more of a salad than a pickle. This recipe can be whipped up with just four ingredients and pairs well with Korean meals and sandwiches like Korean street toast, barbecued beef (Bulgogi), or egg toast (Gaeran tost-u). For best results, use a Daikon radish found in most Asian markets. The best radishes are fresh and firm, clean and smooth, and white. This Vietnamese radish recipe balances flavors like the salty brine of pickles and the slightly sweet balance of sugar. The combination of white and orange colors, from the carrots and radishes, provides a visually attractive appetizer. The two different root vegetables go well with Vietnamese spring rolls, rice, and noodles. Is It Possible to Make Vegetable Confit?